On a perfect afternoon for football, Ruthin hosted Oswestry. The team consisted of a new formation and three changes to the line up from our visit to Oswestry. The first half was very even and, although Ruthin had the better of the chances, Oswestry took the lead with a well-worked goal. The equaliser was scored by Chris L with great control and composure. Half time 1-1. Two changes were made at half time with Owen and Ricco coming on. This was Ricco’s first match and his speed gave Ruthin an extra attacking tool. The game became stretched and Ruthin took advantage of the situation scoring two quick goals, from Ish Q and Marco C, both debut goals. 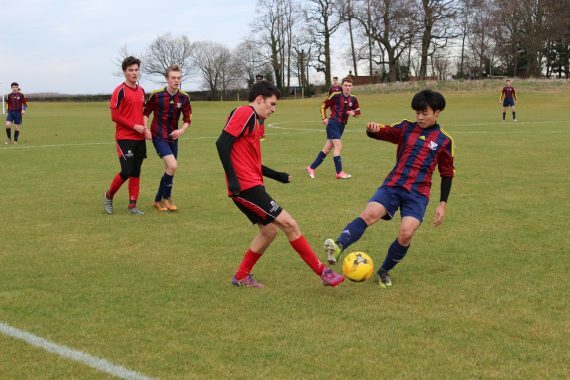 The scoring was completed brilliantly by Alex, who flicked the ball over the opposition’s head before shooting. The keeper saved, but Alex followed up to head home. The final score was 4 – 1 to Ruthin.